On June 8, 1752, in colonial New York, a Captain Grey paid a visit to the lodgings of one Lord Lempsler. The Captain, following etiquette of the period, sent up his name with the servant, with an urgent request to see the lord. Acquaintances claimed that the Captain had “forced a misfortune” upon Lord Lempsler; perhaps he was coming to apologize. It was a fine day. When Lord Lempsler came down to see the Captain, his manservant assumed they were assembling for a “party of pleasure”: in today’s terms, that they were going for a stroll in the sunshine. The servant fetched them dishes of chocolate in preparation for their promenade. Lord Lempsler drank his dish, and encouraged the Captain to take one as well. The Captain refused, though with the utmost civility. One can almost hear Lempsler entreating Grey to partake of the polite ritual, the drink of the genteel: “For heaven’s sake, man, take your chocolate!” Had Captain Grey drunk the chocolate, it would have signaled that he was at ease, comfortable enough to share this civility with his social superior. But civility was not, as it turned out, the order of the day. The men took their stroll. A Mr. William Powell, master of music, saw what happened between them in the park. Swords were drawn. Lempsler gave ground, moving back, as the Captain fell to his knees. Recovering, Captain Grey made several thrusts with his sword, but Lord Lempsler parried them, continuing to move backwards. Then the Captain fell dead, felled by just one deep wound. So opened a recent application I made for a Mars American Heritage Chocolate grant. Among other research lines, I have an ongoing project that I turn to whenever I feel like spending some time in archives. While my work is always interdisciplinary, I really do enjoy the historical method, maybe best of any, and I like sitting in libraries or other hushed archival spaces, reading old newspapers and ephemera. This particular project takes me sometimes to the grand halls of the New York Public Library, where I am investigating the social and cultural meanings of chocolate in colonial New York. I am interested in scenes such as the true story above, in which chocolate played a role in the rituals and customs of the day, in particular as an indicator of social hierarchy. This research seemed a good fit with the American Heritage Chocolate grant, which is awarded to both retailers and scholars who are engaging in some way with chocolate’s earliest history in America. So I sent off my application, and then turned my attention back to other things. I came home the other day to find a large, heavy FedEx box waiting on my doorstep. The sender was Mars company. In the past, I have approached Mars about making a donation of chocolate to my class, Chocolate: A Global Inquiry, at UW Bothell, so my first thought was that perhaps they were fulfilling that request. Only I am not teaching that class this year, so it couldn’t be that . . . I also don’t know anyone who works for Mars . . . except for Forrest Mars, Jr., the man who, with his brother John and sister Jacqueline, built the company into the global chocolate empire that it is today. I met Mr. Mars when, strangely and fortuitously, my two great passions—chocolate and Antarctica—unexpectedly overlapped. A few years ago, I took a sabbatical from UW and from chocolate to spend some time on the ice. I worked a season as part of a four-woman team running the historic base at Port Lockroy, on the Antarctic peninsula. Forrest Mars, Jr. is a great supporter of Port Lockroy, and he and his family and friends came to visit us there. They toured the museum and we had a drinks party in our hut, and afterwards Mr. Mars generously invited the four of us on board the yacht for dinner. Bowls of M&Ms were everywhere, and I ate them by the handful—but only, of course, the blue, red, and brown ones. As I sat chatting with Mr. Mars, he noticed my M&M color preferences. I did not even have to explain; he just nodded, with perfect acceptance, and I saw the light of understanding in his eyes. Evan as I sat there, I knew that it was one of the great meetings of my professional life. So as I stood on my doorstep, holding the heavy FedEx box, for a fleeting, nonsensical moment, I thought that Forrest Mars Jr., the man who arguably more than any other shaped global tastes for chocolate, had sent me a box of his candy. Almost immediately, however, I realized that would be ridiculous: he doesn’t even have my address. I had gotten the grant, and they had sent me a large, heavy set of documents to sign in acceptance. 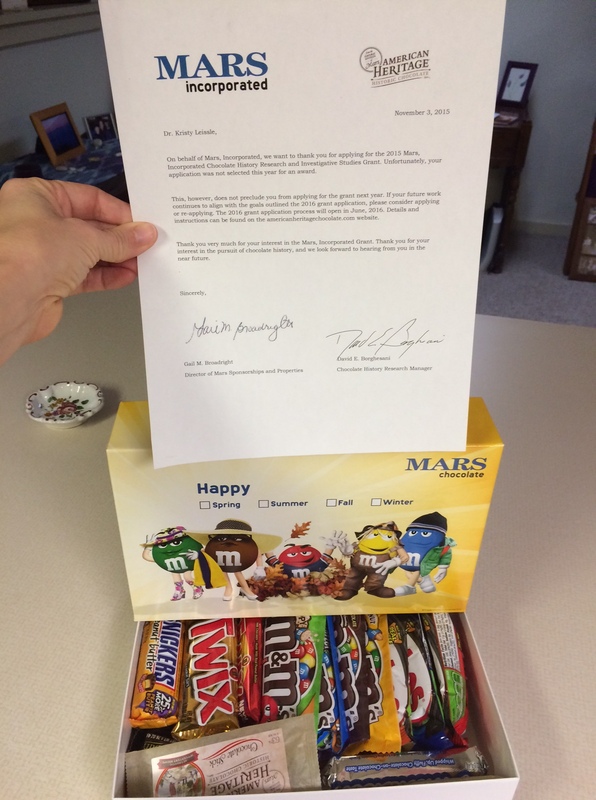 I had gotten the grant, and they had sent me a large, heavy box of chocolate as congratulations. Or . . . I had not gotten the grant, and they had sent me a large, heavy box of chocolate as consolation prize. The letter confirmed the last of those: rejection. I laughed for the next half hour. I sent my friends photos of the giant candy rejection box. Who sends a huge box of chocolates to console grant losers? It’s brilliant. And it’s a great selection—seemingly every Mars chocolate product, including some American Heritage bars, which I’ve been meaning to try. It was the best rejection letter of my life. Thanks, Mars! I’m going to apply for your grant again next year, and I hope you reject me again! < Previous Hershey Kisses Deluxe: Innovation for the better? Next > A cocoa nib a day . . .